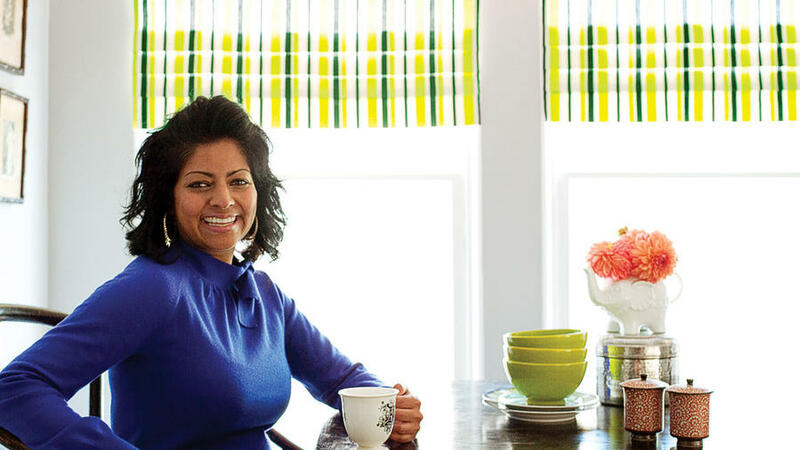 Interior designer Kishani Perera in front of her faux Roman shades. In rooms where privacy isn’t important, likes to install short faux Roman shades. Because they aren’t full-length (and can’t be raised and lowered), these tricksters require far less fabric than the real McCoy and can often be made from inexpensive remnants. For the kitchen window shades shown here, Perera splurged on decorator fabric, and the project still cost her only about $60 per shade. For a less expensive option, consider fabric and hardware from , or pick up some remnant fabric at your local fabric store. First, she hemmed the fabric edges and stitched folds into place. 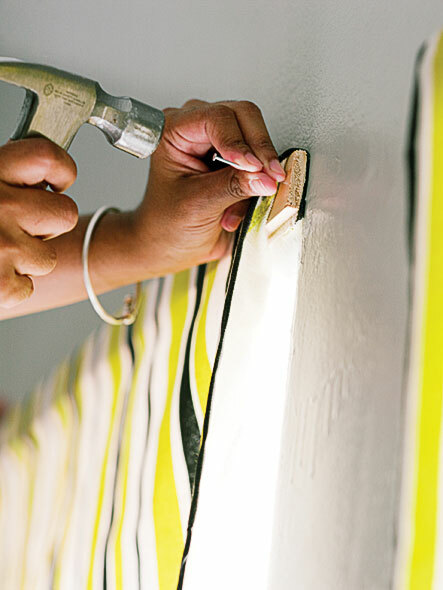 Then, rather than buying expensive mounting hardware, she attached the fabric with double-stick mounting tape to balsa wood and nailed that to the wall. “The hardest part was keeping the stripes straight as I folded,” Perera says. 1. Measure your window. (If you want the finished shade to be wider than the window, add that measurement to your window width.) Decide how long you want your shade, and how many folds you want. (Start by considering two to four folds, each 1 to 4 in. deep; the larger the window, the deeper the folds should be.) If your fabric isn’t as wide as the shade, cut two lengths and sew them together (don’t forget to match the pattern!) to achieve the desired width. 2. Cut the fabric 4 in. wider and about 3 1/2 in. longer (plus the amount of fabric needed for the folds) than your planned finished shade. For one 3 1/2-in. fold and two 2 1/2-in. folds (plus the 2-in. hem and about 1 1/2 in. for mounting), as in the photo, designer Kishani Perera added 12 in. to the length. 3. Turn up, pin, and sew a 2-in. hem on the bottom and sides. 4. Create the folds: Start folding the fabric from the bottom. As you turn up the fabric, secure the folds with pins. For this tailored stripe, Perera ironed the folds. She sewed the folds with a few stitches (i.e., tacked) every 3 in. For a billowy look, don’t iron; sew (i.e., tack) the folds at each edge and once in the middle. Remove pins. 5. On a clean, dry work surface, attach the tape to the length of one side of the balsa wood. 6. Attach the fabric to the wood: Lay the wood down, tape side up. Place the fabric, right side up, on the tape, lining up the top of the fabric with the top edge of the wood and smoothing to prevent wrinkles. Flip the wood over so the shade drapes over it, hiding the wood.